A good number of rumblings surfaced in the past regarding the launch of Apple’s next-generation tablet. Majority of earlier rumors claimed that the new iPad could possibly be out as early as February. However, the most recent round of reports points out an ‘iPad 3 event’ on March 7th. iMore broke the news of imminent iPad 3 Event scheduled for March 7th by the Cupertino-based tech giant. We have heard a lot about iPad 3 launch in the last few months and this report seems to fall in-line with those rumors. If the iMore sources are right, then we are not far from having the next-generation of Apple’s tablet device in out hands. iMore also claims that it sources has confirmed the fact that the iPad 3 will feature a quad-core A6 processor and a latest 2048-1536 Retina display. A good number of rumors consensus over the availability of at least these two specs in the upcoming iPad device. Although, many of you are still doubtful about the launching date of iPad 3, we have something really impressive to back this report – Jim Dalrymple of LoopInsight has also confirmed this report with a big “Yes”. Furthermore, the ex-MacWorld editor has also hinted that he is hearing that Apple is planning to hold its iPad event on Wednesday, March 7th. 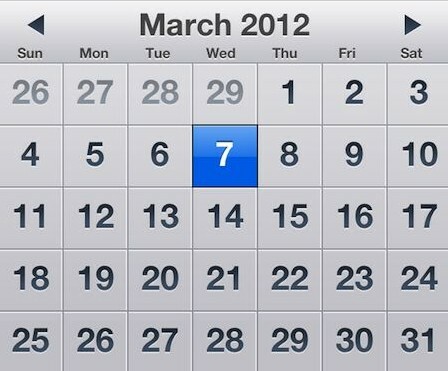 AllThingsD, a popular online blog, also predicted ‘first week of March’ as the launch date of next-generation iPad. If all these reports bear out, we hardly are three weeks away from experiencing the third-generation of Apple’s most popular tablet device. We strongly wish to see the much rumored Retina display and LTE support features in the next-generation iPad. We will update you as soon as more details appear on the scene.